We’ve all wondered where God is sometimes. It seems like he isn’t anywhere. We know he is there but he feels so far away. The past several months I’ve felt dead inside. I knew God was there but I couldn’t feel him. I felt so lost, so broken and so afraid. I’ve been going through a spiritual battle. Literally there is a spiritual battle in my home. I have felt the presence of evil in my own home. I wrote it my fridge calendar and underlined ALL. I stood in my kitchen listening to a song and I lifted my hands, sang, praised and worshiped God. I felt his presence and was overwhelmed with joy all I could do was cry. I had peace in my heart for the fist time in a long time. Believe it or not but it happened. I’ve been pressed down and felt like I was in chains of sadness and doubt. My heart was broken and I felt trampled. Things may not be perfect but they are getting better and I am thankful! The song Find You On My Knees by Kari Jobe came to mind. Troubles chasing me again, breaking down my best defense, I’m looking. God I’m looking for you. Find you in this place I’m in, find you when I’m at my end. Find you when there’s nothing left of me to offer you except for brokenness. You lift me up, you never leave me thirsty.When I am weak, when I am lost and searching. I’ll find you on my knees. So what if sorrow shakes my faith? What if heartache still remains? I’ll trust you. My God I’ll trust you. ‘Cause you are faithful. And I will find you in the place I’m in. Find you when there’s nothing left of me to offer you except for brokenness. You lift me up, you never leave me thirsty. When I am weak when I am lost and searching. Find you on my knees. When my hope is gone, when the fear is strong, when the pain is real and it’s hard to feel. When my faith is shaken and my heart is broken and my joy is stolen God I know that you lift me up you never leave me searching. This song speaks to me. So what, IF sorrow shakes my faith? So WHAT, IF heartache still remains? I’ll TRUST YOU. MY GOD, I’LL TRUST YOU. I will trust God! He never leaves me thirsty or searching. Other things in life do but not God. 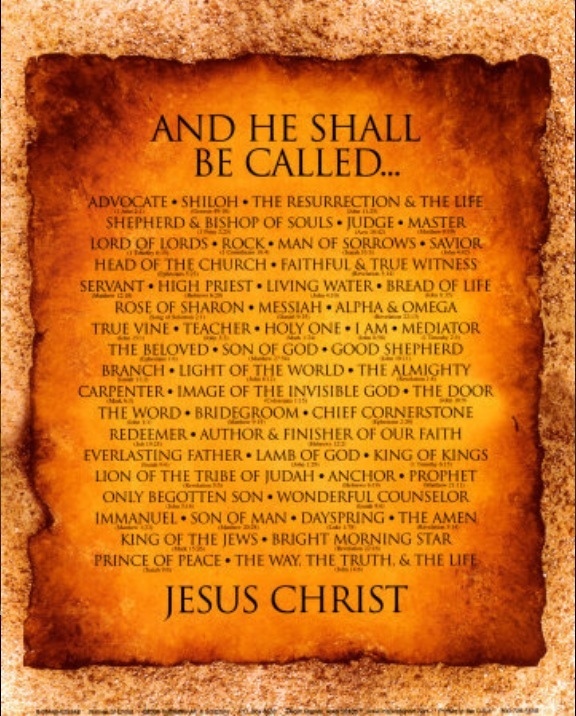 He is my healer, my savior, my love, my life, my joy, my hope and my salvation! So even when everything is falling apart God is allowing that so he can pick up the pieces and put them back together better than my attempt. He makes the pieces fit even when think they cannot. I love when you’re going through something and a verse pops into your head. I’m beyond my breaking point in a certain situation. My husband and Mom have been reassuring me that everything will work out but I cannot see how. 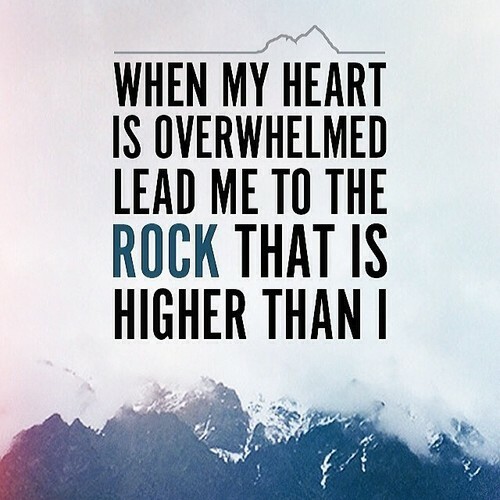 I was thinking about how overwhelmed I’ve been and Psalm 61:2 popped into my head. I was sitting at my desk and started to cry. It was just like a breath of fresh air. I felt like God was reminding me to give my burdens to him because he can handle them. 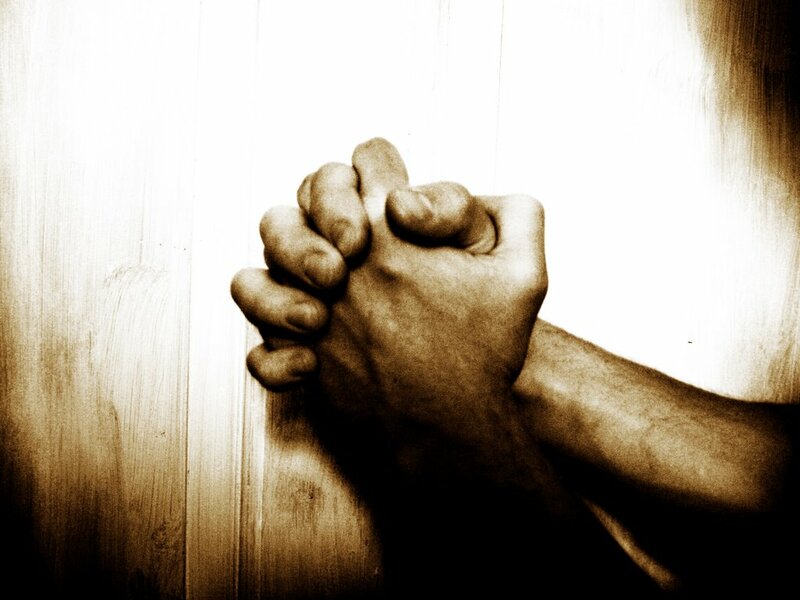 I know that no matter the outcome whether the situation is resolved or not, God will help me through it. If the situation isn’t changed he will give me the strength to get through each and every day. I have to believe that change is ahead for me and that a new door of opportunity will be opened and the doors that need to be closed will be closed. While I’m waiting for God to move I need to keep my ears and heart open to listen to what God has to say. Sometimes we busy ourselves so much we don’t take time to listen to what God is saying. We miss Him reaching out to us because we are so caught up in our lives. Maybe all this time I’ve missed the little reminders that God is with me and that he is working on it because I’ve been too caught up in my situation. 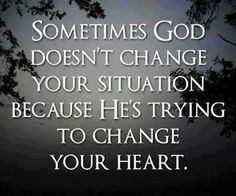 Sometimes God doesn’t change our situations because he’s trying to change our hearts. That sometimes is the hardest words to swallow. They are bitter and hard to chew. 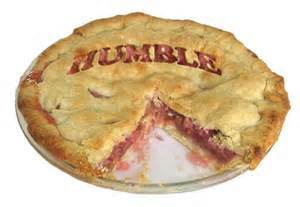 I think I’m going to have another serving of humble pie! If you think of me pray for me that God will move and change my situation or change my heart about it. A few days ago I caught glimpse of myself in a large mirror. I almost shrieked with horror! I was not prepared for what I saw. I have always been self conscious. I tend to judge myself harshly. I tried to look at myself with God’s eyes instead. He sees me as his child. No matter what I look like, he loves me. 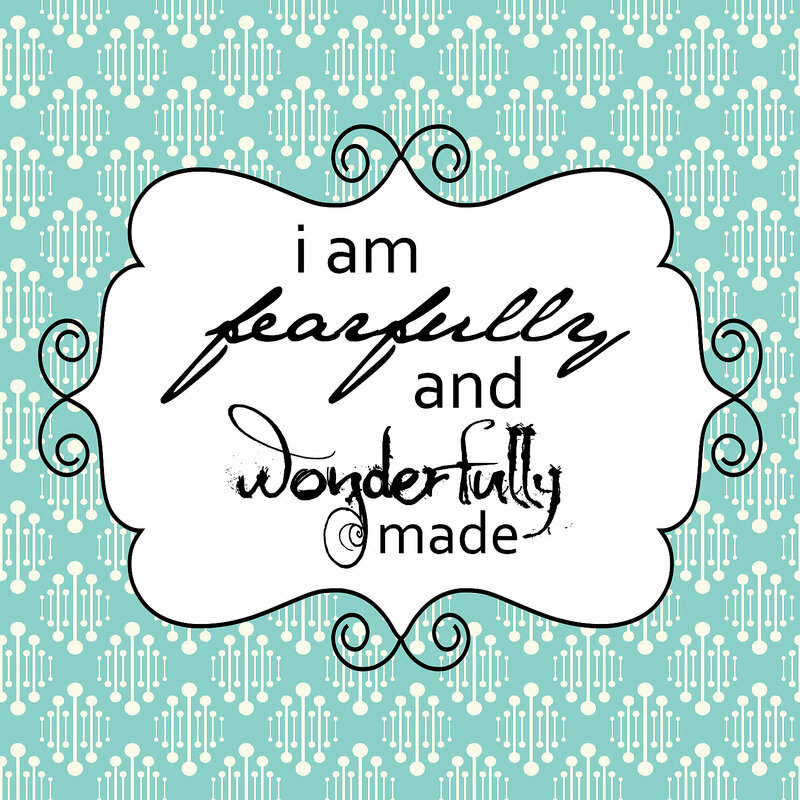 He created me to be exactly as I am. Every part of myself is what he designed. I started reading The Purpose Driven Life by Rick Warren. The first day really got to me. So far every day has really gotten to me. It has made me mad, sad and hopeful all at the same time. If you haven’t read it you need to! It is a 40 day thing. There isn’t much to read each day. Day 2’s “Point to Ponder” was I AM NOT AN ACCIDENT. The entire section for Day 2 was filled with how God made us and let us have the parents we have, the bodies we have, our brains , our pasts, circumstances and everything else about ourselves and our lives because he wanted us that way. We have a specific purpose that can only be fulfilled by us the way we are. That really hit home to me. I never thought that everything about me was made the exact way God wanted it to be. I’ve always compared myself to models and other women and it left me feeling less than I should. It was refreshing looking at things that way instead of my normal view of myself. Have you ever felt you were less important or that you weren’t as good as others? This is a lie!!! God made each of us special. We are all custom designed. We are not cookie-cutter people!! Something I always thought was a bad thing is actually an amazingly wonderful thing. When I was a little girl, I remember catching part of a movie on T.V. It was an older movie, maybe made in the 50’s or 60’s. Everyone was to be transformed in this machine to a certain look. “Normal” people weren’t acceptable. There were 3 or 4 models you could chose from. There was a homely looking girl who refused to be made into this image. She was determined to stay true to the way she looked because it made her who she was. The scientist argued with her and even said but don’t you want to be beautiful like everyone else? I never knew if she was forced to be changed or not but she didn’t want to be anyone but who she was made to be. I honestly forgot about that until now! I no longer want to be look or be like anyone else. We are our best, when we are ourselves. On that note I am sick and tired of being sick and tired! I am not treating myself very well. Last year I ate only things that would help my body perform the best that it could. I have almost completely fallen off of the healthy eating and lifestyle wagon. In fact I’m starting to lose the tracks from the wagon wheels! I am starting today going to treat myself better and eat what is best for me and exercise so I can have a healthy body to God’s purpose. I am also going to try to get enough sleep. I always have a problem with that. I am telling anyone who reads this (maybe only my mother) so I can be accountable. 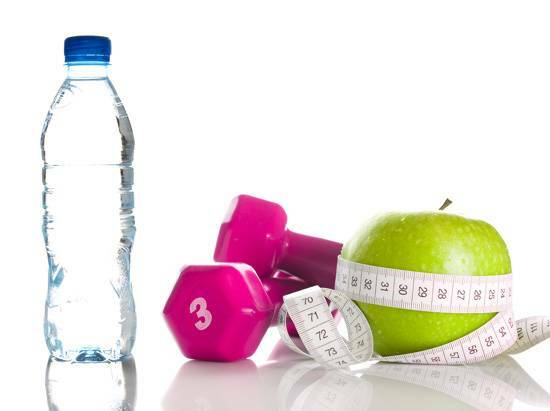 I am going to strive to become spiritually and physically fit! Every once in a while I may post recipes or other things but for the most part this blog will be centered around bible verses and what I get from them to help me in my life and hopefully in your lives as well. I’m glad that I have a savior who knows me when I don’t know myself. He knows my name, the number of hairs I have on my head and he knows my purpose. My Grandma has Alzheimer’s. She has lost who she is, but Jesus knows her and that’s what counts. She asked Jesus into her heart a long time ago. She worked hard taking care of the money for our church. She played the piano for the church and played the piano for The New Jerusalem Quartet. Her purpose was to be a wife, a mother to 3 children, a piano player, a book-keeper, a baker, a grandmother and most importantly a servant of God. I’ve always struggled with my purpose. I know that God creates each of us with a purpose. I know as a Christian that my purpose is to spread the Gospel of Jesus and help those who are seeking Jesus and those who don’t know they need to seek Jesus, find Him. I’ve asked God, how can I serve you and carry out my purpose? What is my purpose? Can I still reach people after all the sins I’ve done? I don’t know if anyone else has ever felt this way. I’ve felt so low and unable to do God’s will because of past sins. Those negative feelings are lies from the devil. He sticks that nasty little finger in our minds and starts stirring up all these ideas so that we will be distracted from what God wants us to do. He enjoys seeing us feel unable, unworthy and afraid. He wants us to think we have no purpose. He has come to steal, kill and destroy. Jeremiah 29:11 says it. God knows the plans he has for us. He created us. Everyone was born with a purpose. No one born is a mistake. Have you ever thought, I’d be better off if I’d never been born? I think at one point or another that thought has crossed all of our minds. It makes me think about, It’s a Wonderful Life. The character John gets to see what the world would be like without him. He sees how the town changes and how the people are negatively affected by him not being alive. He realizes that he has a purpose. He had a reason to be born. 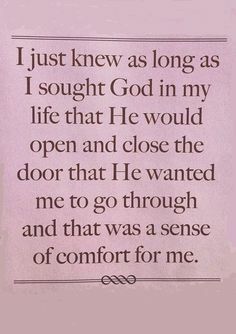 God knew you and who you were going to be before you were born. He designed you with a purpose. So many of us never carry out our purpose. I challenge you to seek God’s purpose for you. Ask him and really listen. Read and pray every day. Trust God to supply you with what you need for your calling and your purpose.